There was once a big family of witches that lived in the forest. They spent their days being mean and casting evil spells, and their favourite trick was to turn children into big, green, ugly frogs. But one witch didn't like being mean. And she never cast any nasty spells. This witch wanted her family to like her but she didn't want to be mean. She liked to use her magic for good and loved conjuring yummy sweets like strawberry laces and lollipops. Candy canes were her favourite though, so she called herself the Candy Cane Witch. The Candy Cane Witch felt scared. She didn't want to use bad magic. She didn’t know what to do. Suddenly, she had an idea! She grabbed the girl by the hand and cast a spell that made them both invisible. They hid in the forest until it was safe. “I’ve got an idea,” said the Candy Cane Witch. She waved her wand and used her magic to make her new friend every kind of sweet she could think of! Delicious gobstoppers, chocolates and hundreds and hundreds of candy canes! “These are the best sweets I have ever had!” said the little girl with a giggle. “Promise,” said the little girl, and the two friends set off on an adventure to take the sweets to children everywhere. Use a sponge and some white paint to cover the face. Apply some glitters for a glowy effect! With a brush and some red paint, draw triangle shapes around the left eye. Create a wart on the right cheek using red and black. Finally, take some purple paint and use a thin brush to draw some wiggly lines on the right hand side of the face. 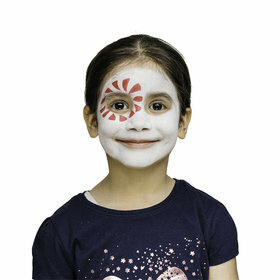 This face painting kit is great for a Halloween party, making up to 50 full faces. 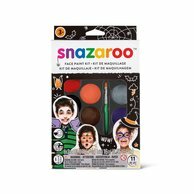 It features 8 spooky colours, as well as a brush, 1 sponge and step by step guide to help you create little monsters, witches and vampires.